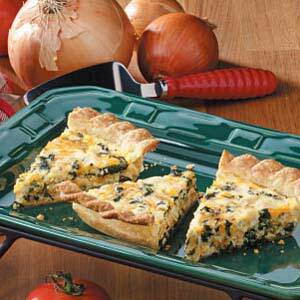 This delicious and versatile quiche features chicken, spinach and cheddar cheese, but you can change the ingredients if you'd like. Use Swiss cheese, asparagus or other vegetable of choice, or if you don't want a crust - spray the pie pan with vegetable spray and pour it in. Sprinkle 1/4 cup cheese into the pastry shell. In a large bowl, combine the chicken, 1/2 cup spinach, onion and remaining cheese (save remaining spinach for another use). Spoon into pastry shell. In a small bowl, whisk the eggs, milk, mayonnaise, salt and pepper; pour over the chicken mixture. Bake at 350° for 40-45 minutes or until a knife inserted near the center comes out clean. Let stand for 15 minutes before cutting. Yield: 6-8 servings.